The last few days were ridden with Motorola One Vision leaks - first, it was spotted at Geekbench, and later information confirmed the name of the phone would be the global version of the Motorola P40. The handset will have three model numbers, with one of them popping up on the Wi-Fi Alliance website, suggesting a launch is closing in as we speak. The phone with Exynos 9610 chipset will have Android Pie, per the WFA listing. 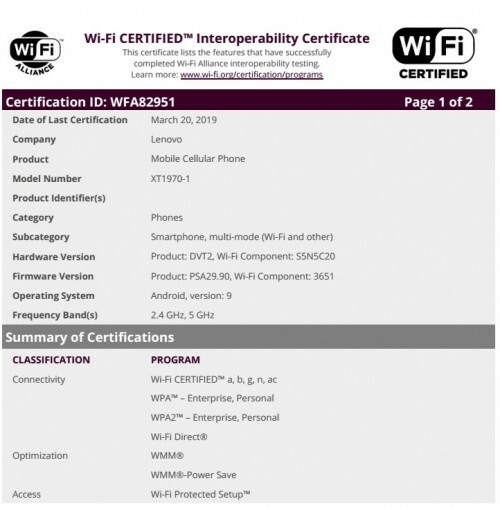 It will have all five key Wi-Fi certificates a/b/g/n/ac, with Wi-Fi 6 nowhere to be seen. The Motorola phone is expected to have a 21:9 display with an in-screen selfie camera and dual setup on the back. Other rumored specs include 48 MP shooter, camera features like “Long Exposure” and “Video 3D HDR”, a 3,500 mAh battery, Blue and Gold colors. Expected to hit Latin America and India as One Vision, the phone will stick to the P40 moniker in its home market.